Los Angeles' first major "celebrity chef" opening of the year comes to us from Brian Malarkey, whom you may know from his appearance on Top Chef and dwindling restaurant empire down in San Diego. 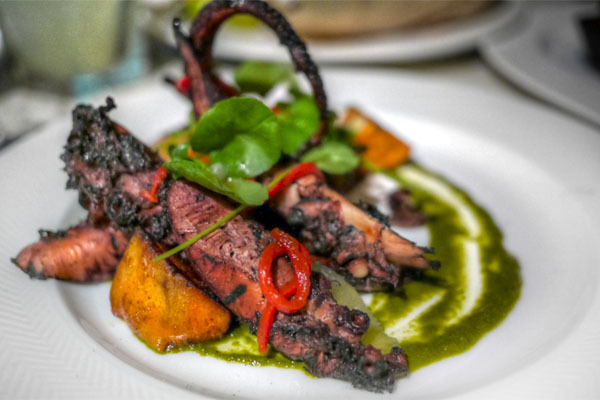 On January 17th, he debuted the second outpost of his "Fish Meats Field" concept Herringbone, set at the Mondrian Los Angeles and replacing the space's former tenant, Asia de Cuba. The eatery, thus, joins the ranks of Enlightened Hospitality Group's other fabric-related projects--Searsucker, Burlap, Gabardine--all of which specialize in "social dining," which you can take to mean that the spot is going to be sort of a scene. About the Chef: Born in 1972, Malarkey grew up on a ranch in Bend, Oregon, and got interested in the culinary arts through his grandmother and her friend James Beard (yes, that James Beard). He eventually made his way to Portland's Western Culinary Institute, and graduated from its Le Cordon Bleu program in 1994. Following, he moved to Los Angeles, where he cooked under Michel Richard at Citrus, before embarking on a culinary tour of Europe and North Africa. 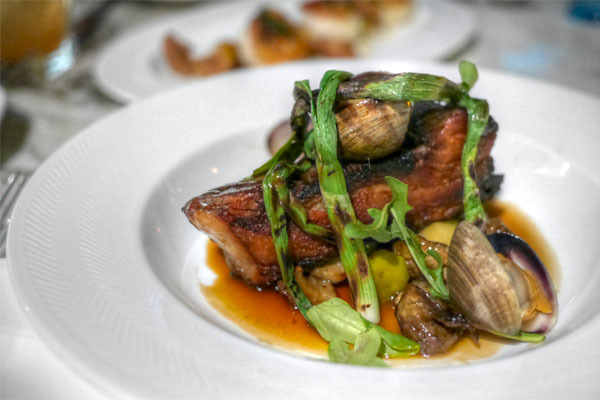 Malarkey then made his way back Stateside and became Sous Chef at the Oceanaire Seafood Room in Minnesota in 2001, but quickly moved to Oceanaire's Seattle outpost as Executive Sous. He stayed there until 2004, then went down to San Diego to open Oceanaire in Downtown as Executive Chef and partner. In 2007, he achieved national attention as a finalist on Top Chef Season 3, and ended up leaving Oceanaire in 2009, ostensibly to spend more time with his family. 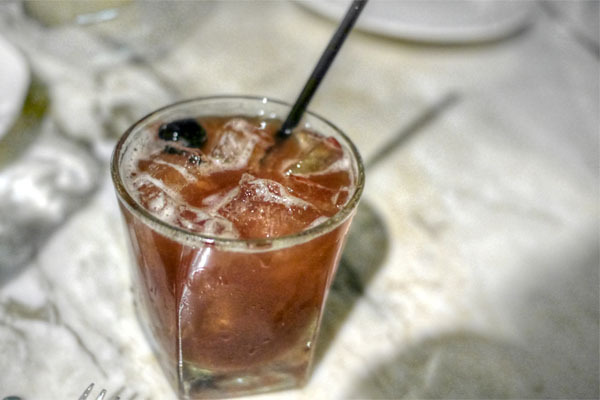 Following the departure, Malarkey teamed with nightlife guru James Brennan to start the Enlightened Hospitality Group, and they launched their first project, Searsucker, in San Diego's Gas Lamp district in July 2010. 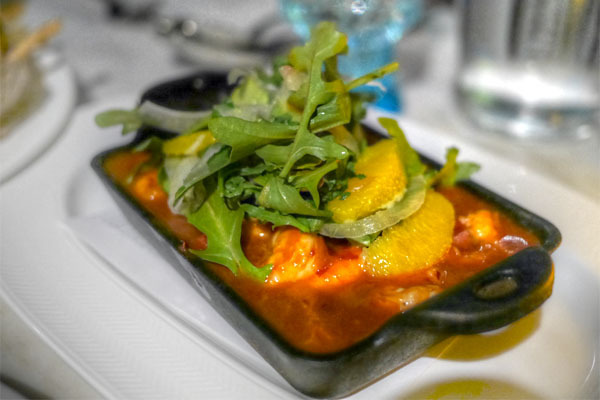 The place was a hit, and its success allowed the duo to open other restaurants, as well as their own catering company, Campine, with Antonio Friscia. 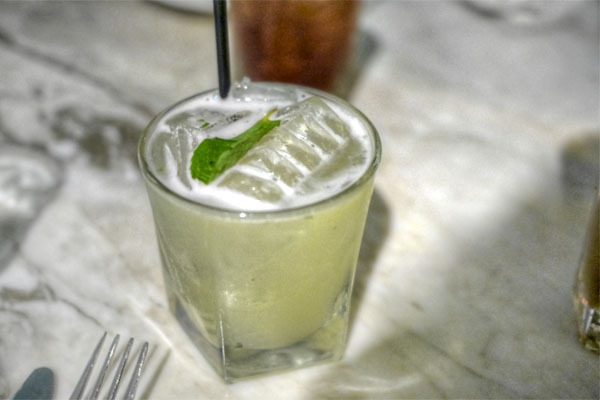 July 2011 saw the debut of Burlap in Del Mar, a sort of "West meet East" fusion-y type place headed by Anthony Sinsay, while Ginham arrived in La Mesa in January 2012. Enlightened's fourth concept, a seafooder called Gabardine, bowed in March that year in Point Loma, and the first Herringbone was revealed in May, helmed by Top Chef alumna Amanda Baumgarten. Malarkey then took an unexpected detour when he invested in Olubugo, a restaurant in Uganda that benefits the AIDS non-profit Aidchild. He rounded out the year with the premiere of Searsucker Scottsdale, the release of his cookbook Come Early, Stay Late, and the introduction of casual cafe concept Green Acre at the Nautilus life sciences campus. 2013 kicked off with Malarkey's appearance on ABC's The Taste, though he hit some bumps that year as well. Ginham ended up shuttering in May after rumors of EHG shopping the place around, while Burlap closed in June. Sinsay was supposed to stay on during the transition, but jumped ship to La Villa, and Baumgarten decamped from Herringbone around the same time, too. On the positive side, Searsucker Austin got underway in May; Searsucker Del Mar commenced similarly in July, set in the old Burlap space; and another outlet of Green Acre opened at Campus Pointe. 2014, finally, has been quite active so far for Malarkey and company. 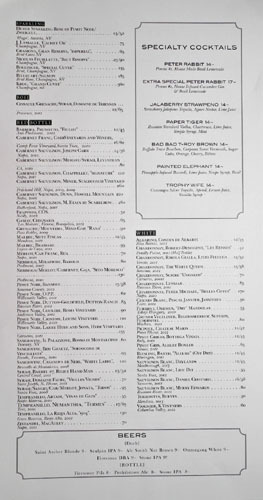 In early January, Gabardine ceased doing business, as did Searsucker in Scottsdale. More surprisingly, a majority stake in Enlightened was sold (for a rumored $28 million) to Hakkasan Ltd, a global restaurant group backed by Tasameem, the property arm of the Abu Dhabi sovereign wealth fund. 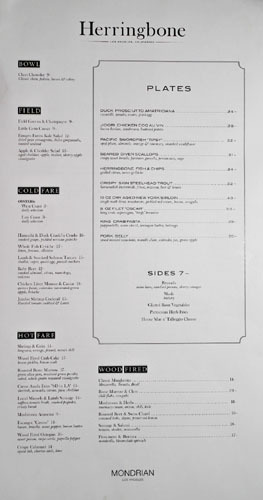 This all brings us back to Herringbone WeHo, the first project of EHGRP's under its new ownership that opened with Anthony Sinsay once again back at Malarkey's side as Chef de Cuisine. Herringbone takes over the old 7,500sqft Asia de Cuba spot, and the space has been revamped by longtime Malarkey collaborator Thomas Shoos. I think beach house living room is what they were going for, if that makes sense, with Schoos' trademark eclecticism present but somewhat restrained. It's a pretty comfy, warm space, though too dim (as in need-to-use-your-phone-to-read-the-menu dim). 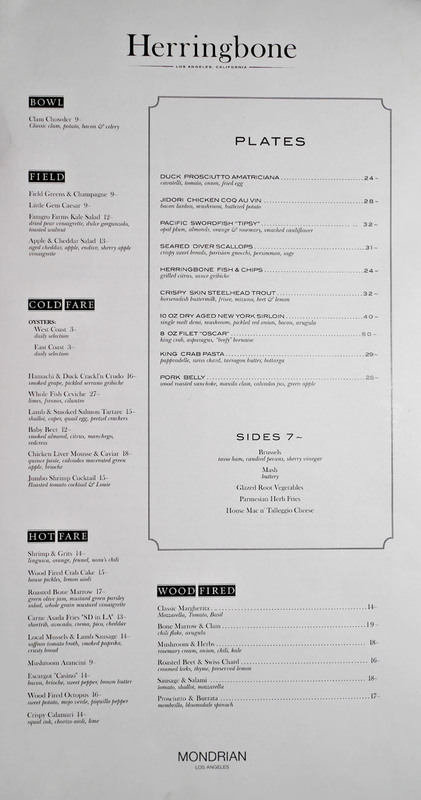 As far as Herringbone's menu goes, it's described by the Chef as "twists" on classic comfort dishes. 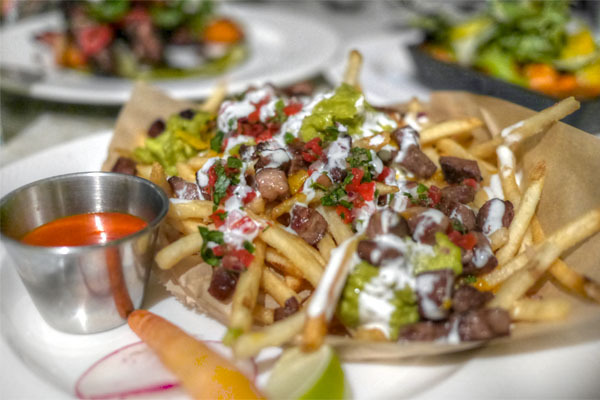 It's not that far off from the menu down in San Diego (though there certainly are WeHo-specific items such as the asada fries), and still features the restaurant's signature blend of seafood, remixed with meat. 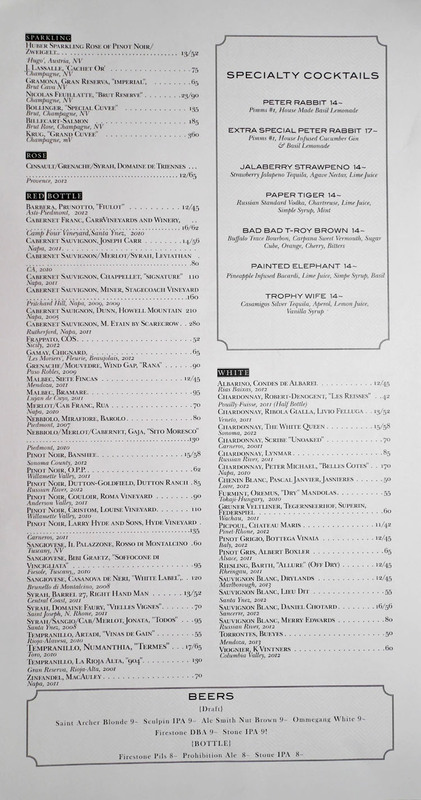 Meanwhile, to drink, you've got a few somewhat-interesting cocktails, a decent wine list, and a smattering of beers. Click for larger versions. 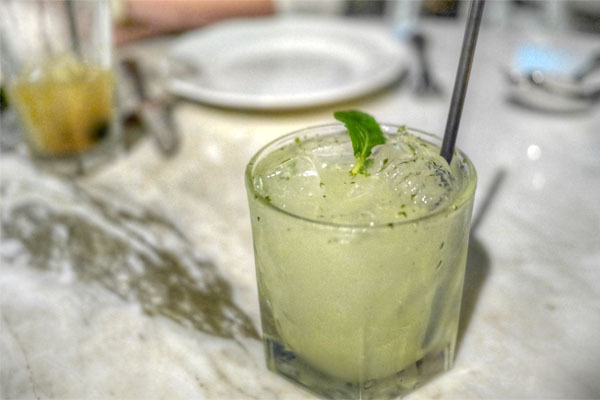 The Painted Elephant drank like a mojito, not surprising given its ingredients, though the basil did impart a bit of a slant on the classic flavors. Slightly more interesting was the Bad Bad T-Roy Brown, which played a boozy base of bourbon against some pleasant bittersweet notes. Nicely integrated. 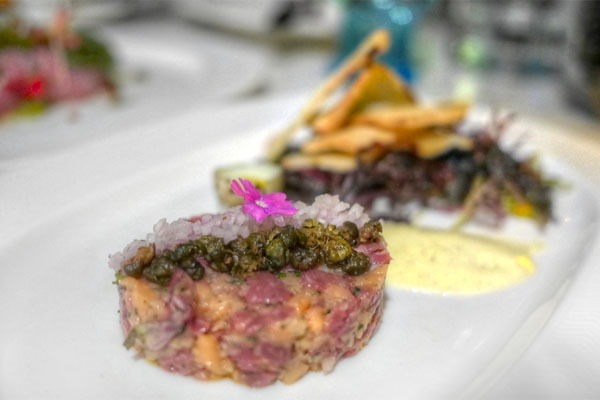 We got started with a tartar that commingled lamb with salmon. It worked out really quite well, the smoky flavors of the fish pairing smartly with the meat, all while the shallots and capers added a bit of zing to the dish. 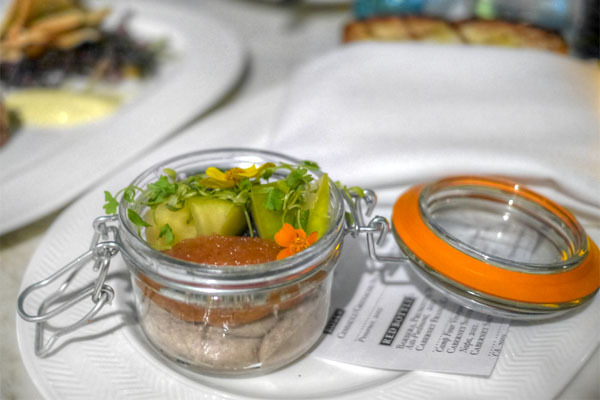 A commendable take on the Continental classic, and one of the highlights of the meal. 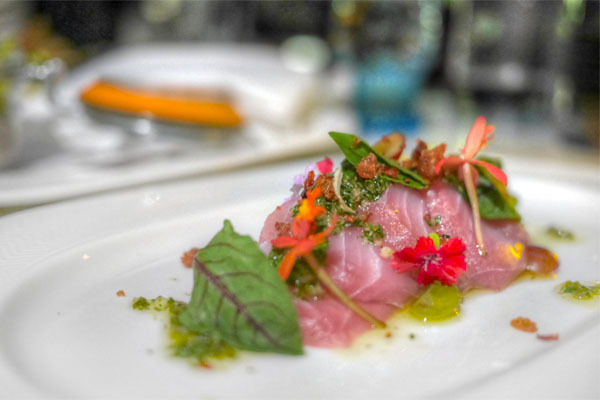 The hamachi crudo also worked things out, with the clean, just-fatty-enough fish accented by the salty crunch of the cracklings and the tang of the serrano gribiche. The last of our cold appetizers was the liver. Here you had the sweetness of the fruit, the saltiness of the caviar, and the earthy smack of the offal. The elements made sense alone, but somehow when taken at the same time, it didn't all come together, and the liver just didn't sing. For something lighter, the Extra Special Peter Rabbit gave up a lemonade-y air to it, the sweet-spicy base of Pimm's working nicely alongside the aromatics of the basil, with the gin adding just a hint of cucumber to the mix. As you might know by now, I'm quite the sucker for octopus, but the version here didn't live up to expectations sadly. The tentacles were just too chewy, and although there was a great bit of char, the flavors were on the muddled side and needed to be developed further. More of that tangy mojo wouldn't have hurt, either. Asada fries are a late night staple of mine, so this was obviously a must-try for me (and you too, probably). I was expecting the kitchen to turn out an uppity version of the dish, but no, this was legit, and just as satisfying as what you might find at Alberto's (or Alerto's), but with better quality ingredients. Yum. Shrimp 'n' grits is another one of those things that I have a hard time not ordering. Herringbone's, though, fell short. The shrimp were a tad overdone, but more concerning were the grits, which lacked taste. I wasn't feeling the citrus here, either, though I did really like the deep flavors of the linguiça, which almost saved the dish. Time for a couple more cocktails. 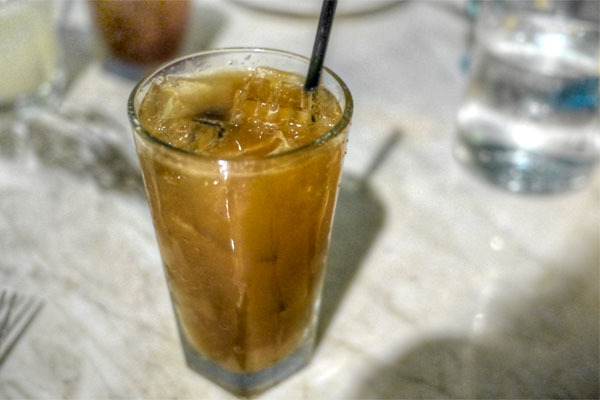 The Paper Tiger was fairly straightforward, the light, bright core of the drink amped up by a trace of Chartreuse complexity. 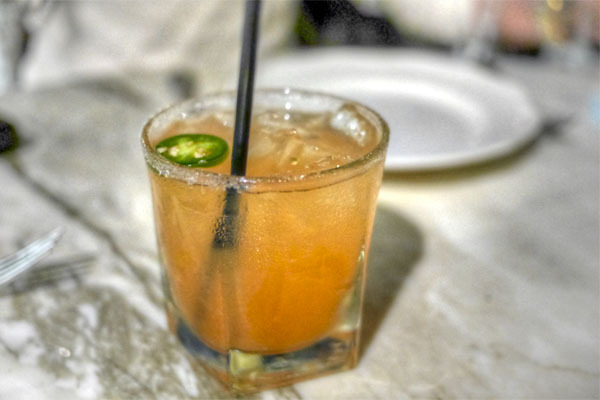 Finally, we had the Jalaberry Strawpeno, which was pretty much a strawberry margarita, but with a lovely undercurrent of heat to it. And now, our two mains. The belly worked out well, the meat displaying a good ratio of fat and lean along with a crispy crust and just boatloads of piggy goodness. I appreciated the astringent counterpoint from the scallions as well, and the whole dish had an Asian-y flair to it that worked. 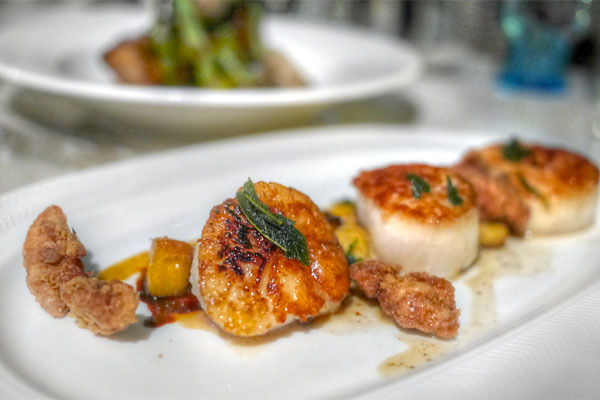 The scallops were also on point, well cooked to a firm, yet still supple consistency, and with a very apparent brine to 'em. I quite liked the textural contrast of the gnocchi here, but the crux of the dish was the use of sweetbreads, which imparted a salty, crunchy exclamation point to the course. 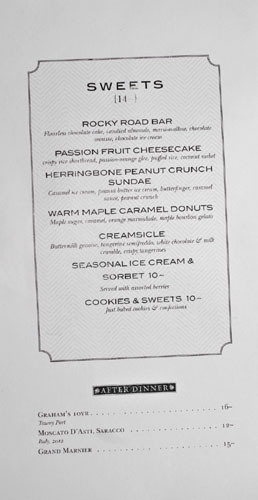 Dessert at Herringbone is a pretty simple affair, with a throwback vibe to it. Click for a larger version. 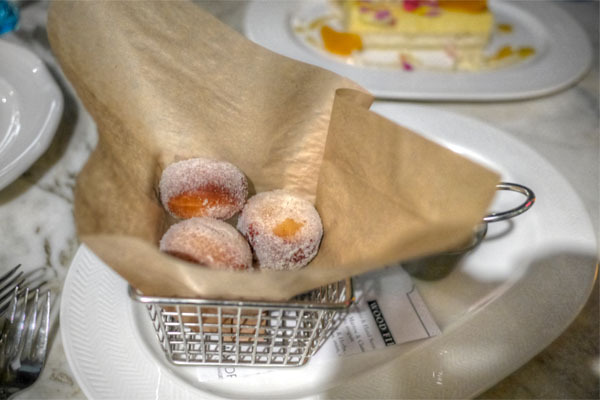 Doughnuts were recommended by our server and delivered as expected, coming out salty, sweet, and fluffy. 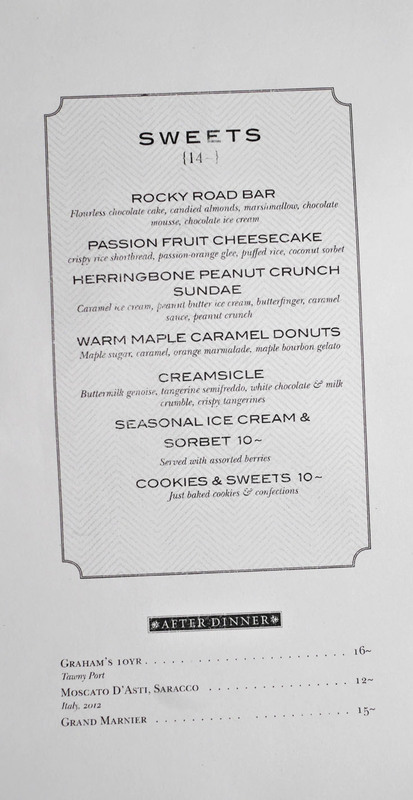 They were rather tasty on their own, but the star here was clearly that ice cream, which perfectly blended the sweetness of maple with a boozy hit of bourbon--I could eat an entire pint of the stuff and be happy. 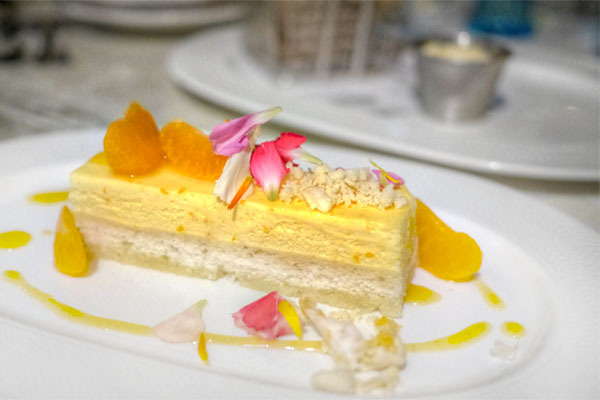 The reimagined "creamsicle" also worked for me, really recalling what's great about the classic dessert, with the citrus playing foil to the buttery sponge cake in praiseworthy fashion. Great textures, too. My meal here was about what I expected. The whole "surf plus turf" concept has merit I think, and came together really nicely in some of the dishes, but at the same time, I took exception to a few of the courses as well. Herringbone is still relatively new though, so I'm hoping that the cooking will be tightened up given some time. Considering the location (Sunset) and the clientele (pretty), you could certainly do worse. Apparently, Malarkey is working on launching an LA outpost of Searsucker as well, so I'd be curious about that one too, though I do hope the Chef goes for something more intimate, and not quite as grandiose next time around. Please stop with the HDR photography. It doesn't look good. I'm glad you toned down your strong hand with HDR but it's still noticeable to the point where the pictures don't look realistic. This is my own opinion but the food seems kind of boring and it's not anything innovative. But that's just my personal opinion. Thanks for the coverage though! Anon: I'm sure you know that I've been using HDR in some form or another since early 2012 right? Anon: Realism is hardly what you should strive for. The lighting is so bad in restaurants that any attempts to accurately reflect the scene as viewed by the human eye would result in woefully subpar photos. Sam: This is the Sunset Strip after all, so unfortunately you really can't expect much innovation, especially compared to what you're used to over there in Chicago. I think the photos and review are spot on while leaving room for improvement. Nice.